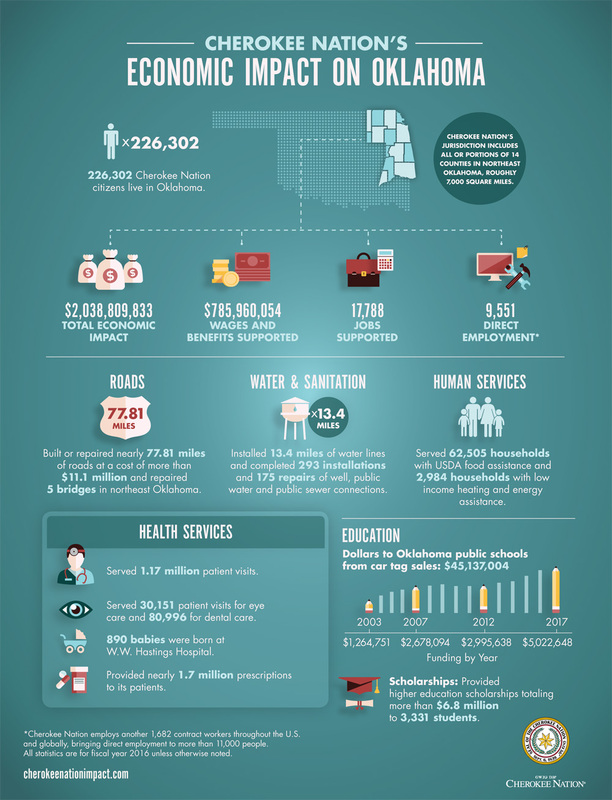 This is the financial impact Cherokee Nation is making annually to improve the lives of Oklahomans. Economic impacts in Adair County support nearly $68 million in county production of goods and services while supporting 902 jobs and $37 million in local income payments. Cherokee Nation government and business operations directly support 491 jobs in the county and purchase more than $17 million in goods and services from county vendors. Cherokee County is home to the Cherokee Nation’s largest employment base, with direct government and business operations supporting 3,580 jobs and $168 million in labor compensation payments. Cherokee Nation operations directly produce $89 million in goods and services while directly purchasing $79 million in additional goods and services from Cherokee County vendors. Cherokee County enjoys significant multiplier effects, with Cherokee Nation activity ultimately supporting $276 million in local production, 5,910 jobs and $221 million in local labor income. Cherokee Nation operations directly support 149 jobs, $7 million in labor income and nearly $2.5 million in local production and directly purchase another $6 million in local goods and services from local vendors. Regional economic linkages generate multiplier effects sufficient to support total Craig County activity of $14 million in output, 273 jobs and $10.5 million in labor income. Delaware County enjoys a significant Cherokee Nation presence, with operations directly accounting for $147 million in county production and supporting 1,039 jobs. Additionally, Cherokee Nation entities directly purchase more than $18 million from Delaware County vendors. In total, Cherokee Nation operations support $186 million in county output, 1,372 jobs and $56 million in local labor income. Mayes County economic impacts continue to grow with Cherokee Nation business expansion in the county. Cherokee Nation operations now directly support 245 jobs, $11 million in labor income and nearly $121 million in local production. Including multiplier, spillover and feedback effects, total economic impacts total $163 million in county goods and services production, 781 jobs and $25 million in local labor compensation. While not home to direct Cherokee Nation operations, McIntosh County nonetheless enjoys a small economic impact by virtue of purchases from local vendors and county residents spending a portion of their Cherokee Nation income in their home county. In total, Cherokee Nation impacts support nearly $2 million in county production, 13 jobs and nearly $700,000 in local labor income payments. Muskogee County experiences economic benefits both from a direct Cherokee Nation presence in the county as well as from direct vendor purchases from local suppliers. Cherokee Nation operations directly produce more than $53 million in local goods and services while directly purchasing nearly $22 million in additional goods and services from local vendors. The direct operations support 373 jobs while the vendor responses and feedback effects support an additional 358 jobs in the county. Including local household spending, feedback and spillover effects, Muskogee County enjoys an economic impact of $113 million in local production, 952 local jobs and $40 million in local labor income payments. Nowata County impacts have increased significantly with the expansion of Cherokee Nation operations in the county. Current reports indicate Cherokee entities directly account for 212 jobs, $9 million in local labor income and nearly $22 million in county production. Additionally, Cherokee Nation businesses and government operations purchase $2 million in locally produced goods and services. In total, Cherokee Nation operations, purchases and local household spending changes support 263 jobs, $10 million in county income and $26 million in county production of goods and services. 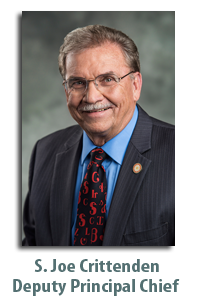 While not home to direct Cherokee Nation activity, Ottawa County nonetheless feels the economic influence of the Cherokee Nation by way of $1.5 million in local vendor purchases and local spending of Cherokee Nation employees residing in Ottawa County. Total Ottawa County economic impacts support more than $3 million output, 53 jobs and nearly $1 million in county income. A strong Cherokee Nation business and employee presence in Rogers County continues to complement significant vendor purchases and exert a significant economic influence in the county. Cherokee Nation operations directly employ 2,159 jobs associated with $117 million in labor income and more than $328 million in local production. Combined with nearly $22 million in local vendor purchases, household spending and all multiplier effects, Cherokee Nation activity in Rogers County supports $386 million in local output, 2,923 local jobs and $135 million in local income. 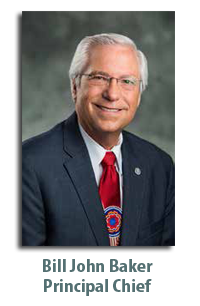 Cherokee Nation activities directly account for 825 Sequoyah County jobs associated with $38 million in local labor income and the local production of nearly $107 million of goods and services. Cherokee Nation business and government operations combine to purchase an additional $16.5 million from local vendors. The vendor response, local household spending, feedback effects and outside county spillovers combine to support a significant multiplier process. In total, Cherokee Nation operations support 1,200 Sequoyah County jobs, nearly $50 million in local income and $152 million in county production of goods and services. Tulsa County benefits from its status as a regional trade center, enjoying significant spillover impacts from activities that originated in outside counties in addition to their local impacts. Cherokee Nation operations are estimated to directly account for 265 jobs in the county, supporting $30.5 million in local income payments and $229 million in output. Tulsa also experiences a concentration of vendor purchases of more than $131 million. In total, Tulsa County economic impacts from Cherokee Nation operations support $593 million county output, 2,626 local jobs and $181 million in local labor income payments. Wagoner County economic impacts are the result of more than $1 million in local vendor purchases and significant local household spending of county residents from Cherokee Nation income earned in other counties. 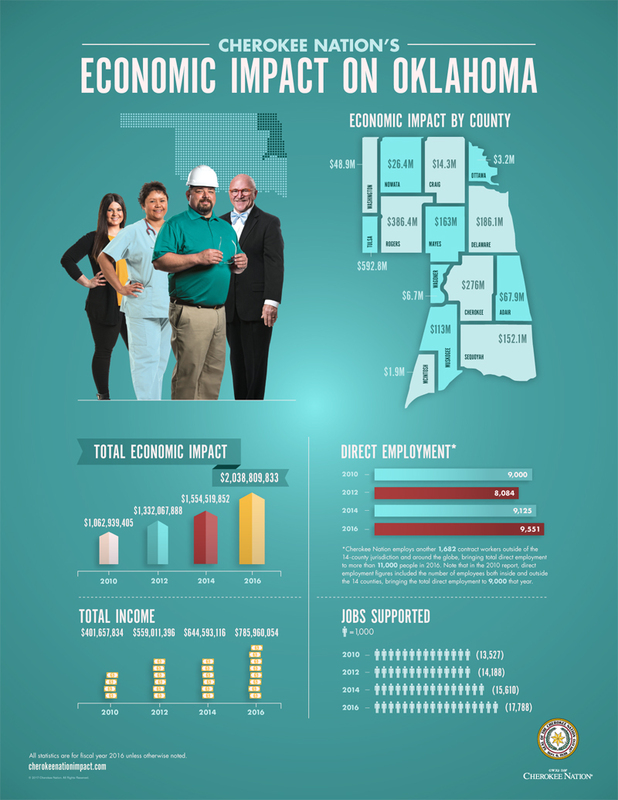 Impacts from all sources support 48 jobs, more than $1 million in labor income and nearly $7 million in county output. Cherokee Nation operations in Washington County directly support 213 jobs, nearly $10 million in labor income and $30 million in local production. Cherokee Nation entities combine to purchase more than $8 million in output from Washington County vendors, while Cherokee Nation payrolls provide a significant source of household income to be spent in the local economy. The combined influence of Cherokee Nation operations, vendor purchases and household spending patterns support a total of 475 jobs, $17 million in local labor income and $49 million in Washington County output.